The most common route of exposure to lead is in and around the home. According to the Canadian Health Measures Survey (2009-2011), the blood lead level of every child aged 3 to 5 years was above the limit of detection. We would expect this due to the many sources of lead exposure. 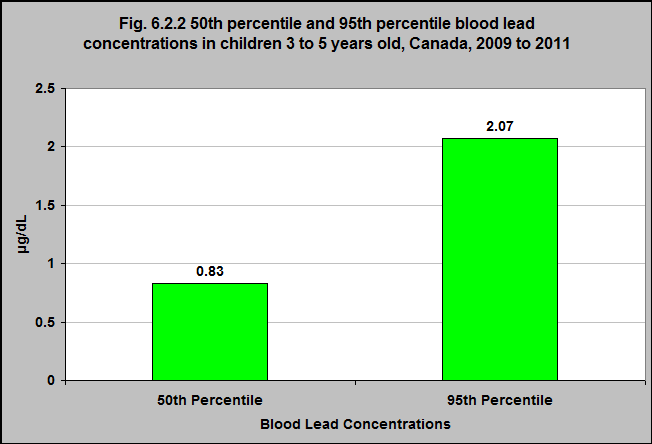 The median concentration was 0.83 µg/dL (meaning 50% of children have blood lead levels above 0.83 µg/dL) and the 95th percentile concentration was 2.07 µg/dL (meaning 5% of children have blood lead levels above 2.07 µg/dL). 1Health Canada. Environmental and Workplace Health: Lead. (2013) http://www.hc-sc.gc.ca/ewh-semt/contaminants/lead-plomb/index-eng.php– accessed March 12th 2017. 2Statistics Canada, Canadian Health Measures Survey, 2007-2009 and 2009-2011 – custom runs. 3Health Canada. 2013. Final Human Health State of the Science Report on Lead. http://www.hc-sc.gc.ca/ewh-semt/alt_formats/pdf/pubs/contaminants/dhhssrl-rpecscepsh/dhhssrl-rpecscepsh-eng.pdf– accessed March 12th, 2017. Lead is one of the most extensively researched toxins and has been linked to many adverse health and behavioural outcomes.